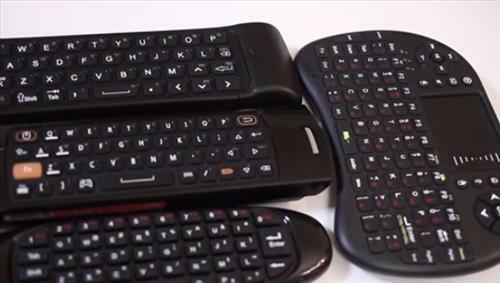 There are many different remote controls and mini keyboards that can be used with an android TV box which can greatly improve a users experience. They come in all shapes and sizes, from standard classical design, to mini keyboards with touch pads to move a cursor around. The best remote will depend on the user as to what is the easiest way to control their box. For example someone who enters a lot of keywords may dislike the on-screen keyboard and prefer a small hand held unit with keys for typing. The size of a unit also varies with some liking mid-sized models and others much smaller. 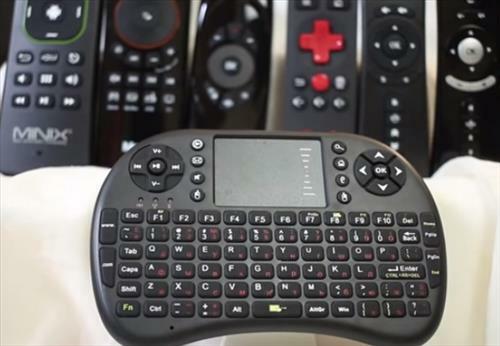 There are many good units with those below our picks for best remote controls and keyboards to use with a android TV box. In full disclosure these units have been sent to us from companies to review which we have done with our own honest opinion and results. *This post contains affiliate links which at no cost to you allows us earn a commission on product purchases. Be sure to read reviews on Amazon, here, forums, or elsewhere to be sure a unit is the right pick for you. 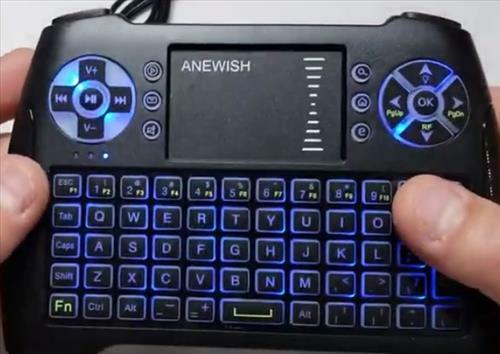 The ANEWISH T16 is built for wide compatibility from a PC to an Android TV box. It has a touch-pad in the center with controller on both side along with a mini keyboard at he bottom. A 2.4GHz USB receiver is plugged into and Android Box and it is ready to be used. The keys are backlit which makes it easy to read the keys when the lights are off. The Rii I8 has been a popular low-cost for awhile option for awhile and still going strong. It has a mini keyboard to type with and a touch pad to move a mouse cursor around. The size is small but still needs two hands to use. A small USB dongle is included that simply plugs into an android box and syncs with the unit and starts working. There is no setup and plugging in the dongle is all that’s required to get it working. This makes it able to work with most any device since it has no need to connect to Bluetooth. Jelly Comb makes this Mini Bluetooth Keyboard touch-pad combo. It works with Android or Windows devices making it highly compatible. The touch-pad is built into the center with the keys on the outside for typing. It is a good low cost unit that works well with android TV boxes, smartphones and more. 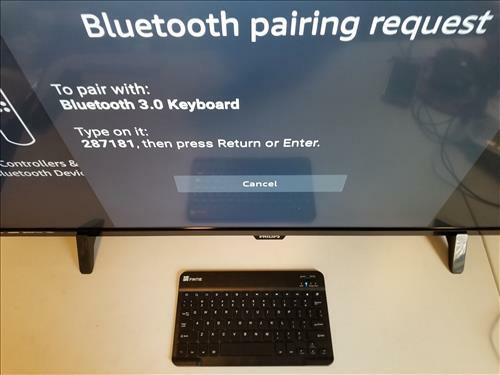 The Fintie mini wireless Bluetooth keyboard is a 10-inch ultra thin unit that is compatible with Bluetooth devices such as Android TV boxes. It Pairs easily with a security code for added protection. All the buttons worked well including the Home and Search buttons. The MX3 Pro is an Air mouse remote control that automatically moves a pointer around a screen. Air mouse remotes have no need for a touch-pad as the mouse cursor automatically appears at the location pointed at. 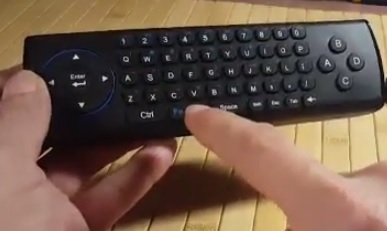 One side of the unit is a standard remote while the other side has a keyboard. The MX3 Pro is a good low cost options that works well with most any hardware from an Android TV box to a Windows PC. This small hand held design is another popular option for those wanting to control their box with one hand. It uses 3 AAA batteries and a USB dongle to connect. 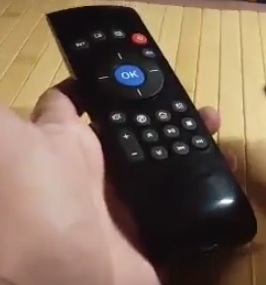 Although small, like a standard TV remote it is a nice design used by many manufactures. It uses a USB receiver dongle which simply plugs into to a USB port to work, this makes it compatible with many android devices from a Raspberry Pi to an android TV box. For those looking for something larger to type with along with a built-in touch pad a mid-sized keyboard is a good option. This unit from 1byone uses Bluetooth and works well with android boxes that have built-in Bluetooth. Mid-sized keyboards are a good fit between a small remote but not huge like a standard model. This 1byone mid sized Bluetooth keyboard is also compatible with most any other android devices from smartphones to tablets. 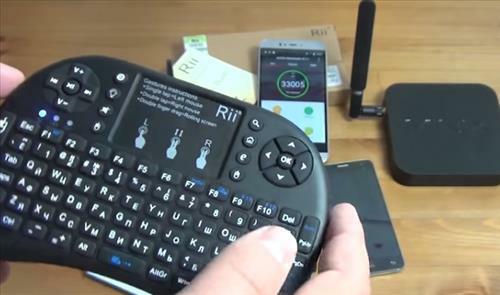 MINIX NEO A2 Lite, QWERTY Keyboard for Android and Six-Axis Gyroscope Remote. Sold Directly by MINIX Technology Limited. 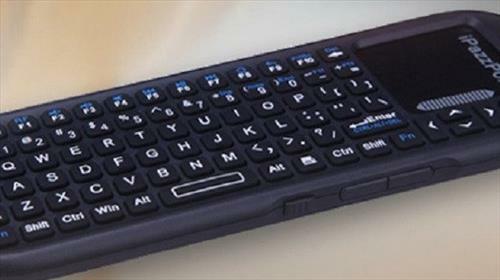 The MINIX is a nice combination remote with a standard buttons on one side and a keyboard on the back. It has a nice build quality that is solid and a material that avoids fingerprints. The buttons are made of a soft rubber and have a nice touch. The back has a keyboard with the keys nicely spaced apart. It uses a small USB dongle to transmit from the box to the remote. Air mouse remotes are a nice option and move the cursor around by holding a button and waving the remote. LYNEC makes this unit with standard keys on one side and a keyboard on the other side. A USB dongle is used to sync up to the remote. Air mouse units are not for everyone but do have a large following, and are very convenient once it is learned how to use. The above units are a few of the types of remote controls available to android TV box users. Many manufactures make their own remotes based on the types above so if you have a favorite brand than they likely have a version available. Mini Keyboard remote controls try to be as small as possible and still fit in a keyboard and touch pad. While nice for many some do have problems with the small buttons. Mid-sized keyboard remotes are another good option if you have big hands and don’t like the small keys. Air mouse units are also good. while they may take some getting used to they are another great way to control your TV box. As always be sure to read reviews on a unit to get the right remote for your setup. I use the Logitech wireless keyboards on my boxes. I love them as I can use the keyboard to turn the box on and off. Aren’t these all wireless (wifi + dongle) 2.4GHz remotes? I want a Bluetooth remote that works like my Roku 3 does. I wonder, if a Xiaomi or a Fire TV, BT remote would work on my Android TV box?? I realize you are better off using the WiFi wireless keyboard compared to the Bluetooth one. While I am not tech wizard, there is some kind of interference when a Bluetooth keyboard is used. Or is this only me? Notice that after updating to android 8.0, some functions break. i.e. .. I’ve been using Rii i25 (awesome remote) for years. worked perfectly until I updated my Ni Box to Android 8.0 , and now the back button won’t work… something about key mapping changed in the OS. The Logitec k400+ should really be on this list too since it’s been one of the most popular options for years now.